The eagerly anticipated match between FC Barcelona and Real Madrid will be distributed worldwide in HD and 3D formats via a signal transmitted by Spain’s Mediapro. Proof of the intense interest the match has attracted worldwide is that many countries had never previously requested customizations of the television signal. So far, nine major channels have requested the service from Mediapro. Accredited media figures exceed those of the last match between Barcelona and Madrid. The technical deployment and media interest are similar to those deployed to an important NBA game, the final of the Champions League or even a World Cup match. To ensure the best coverage, Mediapro has prepared a device with the participation of over 300 professionals, 10 mobile units, one with 3D technology, and 34 cameras at the Camp Nou, 3 for Gol TV, which will offer its subscribers exclusive images. 12 cameras will be placed at the foot of pitch, with two being on the goal line, a high speed camera, a steadycam, and one giving views of the stadium from above. There will also be an Epsio application that allows you to draw a line during the broadcast to mark offside. The match, with an audience of over 400 million viewers, will be followed all over the world. 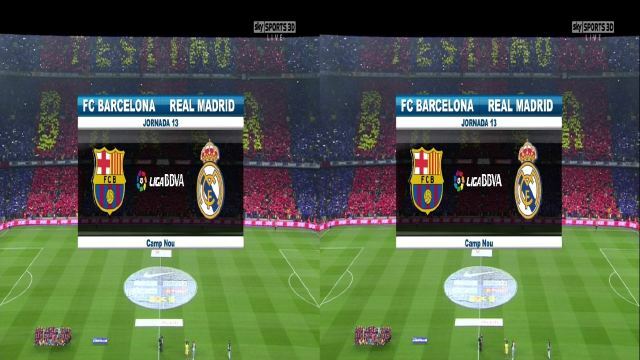 Games between Barca and Real Madrid are some of the most watched events worldwide, and not just in the sports arena. More channels than ever will be showing the match. In Europe, Barca-Madrid will be broadcast on channels including Gol TV (Spain), Canal + (France), Sky Sports (Italy) Sky Sports (England), UNAM (Germany), TV4 (Sweden), Sport TV (Portugal), NTV (Russia). In Asia, it will be shown on Al Jazeera Sports (Middle East), CCTV5 (China), Wowow (Japan); in America, ESPN and Direct TV (Latin America), Sky (Central) Goal TV USA (United States); in Africa it will be shown on SuperSport, covering the entire continent; and in Oceania on ESPN (Australia). The interest aroused by the encounter has been increasing, especially in places like the US, Middle East and Asia. In the Republic of Azerbaijan the match can be seen on Channel AZTV, in Iceland SYN will broadcast the game, and even viewers in Mauritius can see it through Canal Plus Horizon. A total of nine major channels have requested customization of the signal distributed by Mediapro, including Canal+ in France, Poland, Norway, and Sweden, Canal 9 in Denmark, BskyB and ESPN in the UK, and Direct TV in Latin America. Mediapro also produces a specific signal for 3D that has been requested by Canal+ (Sweden), Sky (Italy), Direct TV (South America), and Sky (UK). The specific device for 3D signal includes nine double chambers. The entire meeting will take place in 3D and not use any automatic conversion. A special mobile unit will also be used to transmit the signal.